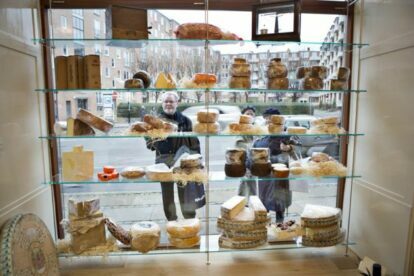 Far away from downtown Copenhagen and even a bit out of the way from downtown Frederiksberg, lies a small cheese shop near Peter Bangsvej Station. Even though it is out of the way, it is most certainly worth the trip. I frequently do a 20 minute bike ride detour home from work to buy cheese in the small shop. Grand Fromage is originally from Denmark’s 2nd largest city Aarhus, but due to their popularity with Copenhagen restaurateurs, they opened up a small shop in Frederiksberg. Grand Fromage is run by father and son, who both have a cheese-making background. The family have been cheese-makers since 1883. This of course shows in their selection of products for sale in the shop. Cheeses are chosen from small artisan producers in Denmark as well as France, Italy and the UK. The staff is of course extremely knowledgeable (it is usually the son working the shop) and you can be quite sure you’ll get a taste of cheese and a good story when in the shop. Apart from cheese, the shop has a small selection of Salamis, hams, freshly baked bread and relishes and other condiments to go with a cheese platter. My personal favorite is the French Epoisses de Bourgogne which you can get at Grand Fromage at a perfect level of ripeness. It becomes extremely smelly and runny when it is mature enough to eat. Yummy!